In parallel, we’re already preparing an energetic summer, with the arrival of fascinating new artists at our M.A.D.Gallery – but also gearing up for the launch of our next Legacy Machine, LM2, scheduled for this September. How do you make a best-seller even better? That’s the challenging question we asked ourselves when we started working on a new generation of our best-selling line, Horological Machine N°3. 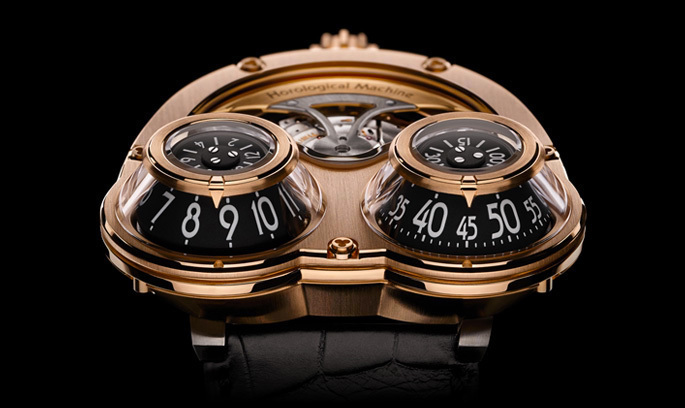 Since 2009, the HM3 series has not only represented almost 40% of all the MB&F pieces in circulation, it has also proven to be highly versatile with a range of variations. Our approach for this new generation of HM3 was: take the most iconic elements of the series – the winding rotor and the hour and minute domes – and re-engineer them! 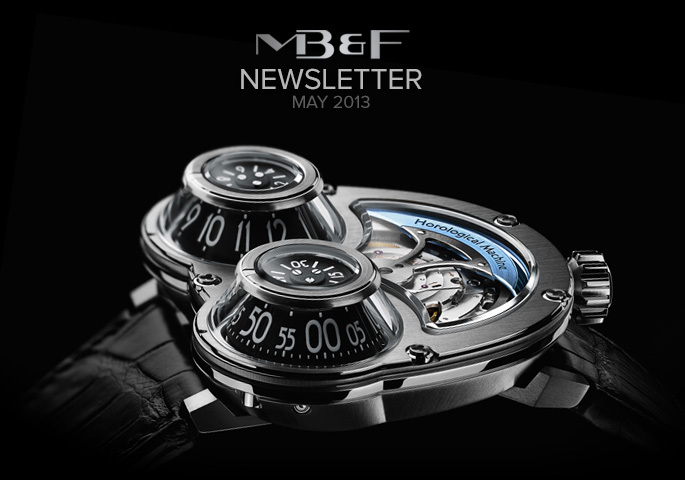 The signature MB&F “battle axe” rotor has become one of our most recognisable design elements, and it was already one of the first things you noticed on the original HM3s: thanks to the construction of the automatic movement, which is flipped upside-down, the rotor is placed right on top of the case, perfectly visible through a sapphire crystal. The new giant rotor has extended its reach to the very limits of the case – giving this Machine its name, ‘MegaWind’. 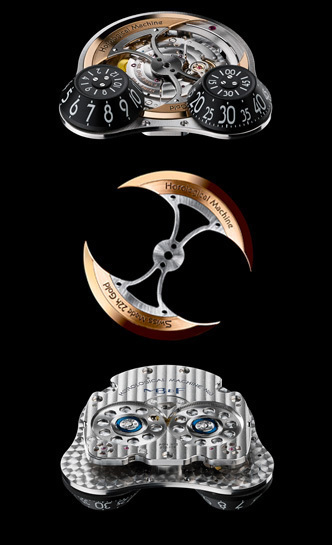 The construction of the rotor has changed too: previously crafted from one piece of gold, the new rotor’s centre and arms are made of lightweight and tough titanium, while the blades on both sides are 22k gold; the three pieces are firmly riveted together. The second very distinctive feature of HM3 is the unmistakable hour and minute indication cones, which rise above the case. They’ve been optimised too: taking inspiration from the HM3 Frog variants, we’ve changed the previous static construction and opted for revolving, paper-thin aluminium cones. Combined with much larger numbers, this system improves legibility significantly (see below) – and adds an extra dose of “kinetic” to the Machine. 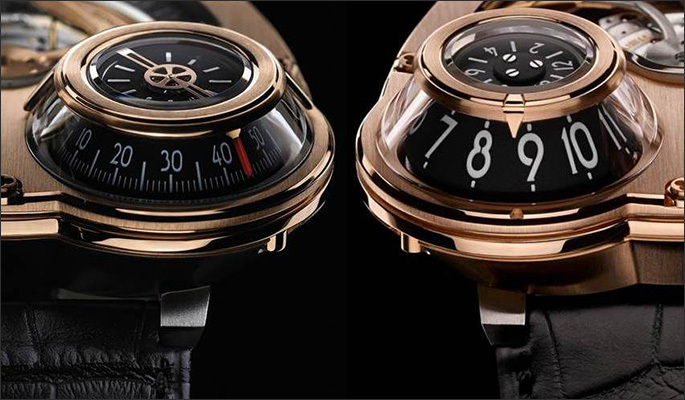 The new MEGAWIND is available in red gold, with a matching red gold rotor, or in white gold with a striking sky-blue rotor. For all the details including high-res imagery and technical specs, please click here. After Didier Dumas and David Lamy, I’d like to introduce you today to another member of our team: watchmaker Georges Veisy. His unusual life has been – quite literally – a series of ups and downs… starting with his place of origin, up in the French Alps of neighbouring Haute-Savoie. This triggered a complete professional reconversion: Georges bravely decided to start over and become a watchmaker. Three years and two diplomas later, he accepted his first watchmaking job with the Swatch Group after-sales service in Besançon, followed by more after-sales with Breitling. 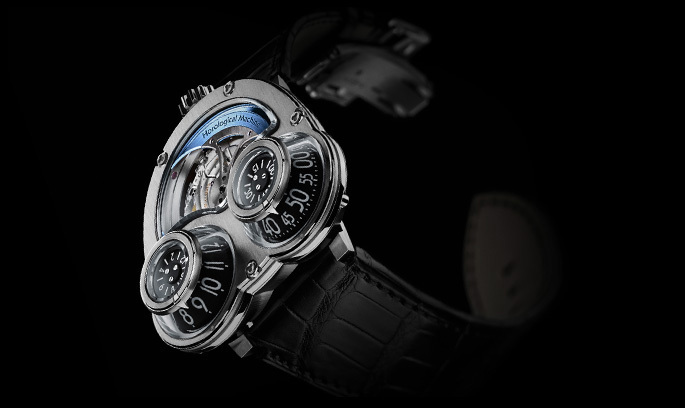 His next move was a Manufacture: Breguet in the Vallée de Joux. He stayed there 7 years before moving to Geneva in 2004, for Harry Winston – which I was managing at the time. Our paths parted a year later, when I started MB&F… but we met again in 2008, when Georges accepted to join our growing team. According to Georges, moving back to Geneva and his native Haute-Savoie region is definitely high on the “up” scale, and not only thanks to the professional challenges he faces with our crazy team of watchmaking rebels… The really good news is, his determination has proven the doctors wrong: he walks, and he walks a LOT – on the weekends, your best chance to catch him is on a lost hiking trail somewhere in the Alps! At 58 metres high and weighing 550 tons, SeaOrbiter will be a stunning 12-deck, semi-submersed nautical laboratory built from recycled aluminium, housing a 20-strong team of scientists who will use this sun- and wind-powered craft to explore the Seven Seas – both above and below the surface. The graceful vessel – towering 27 metres above the waterline and plunging 31 metres below – resembles a dolphin in mid-leap. SeaOrbiter was designed by French architect Jacques Rougerie and with 75% of its funding already raised, construction is due to begin next year. The plan is to eventually have a fleet of five SeaOrbiters covering the world’s oceans to collect and share data to improve our knowledge of the marine ecosystem, the value of its biodiversity and its influence on the terrestrial environment. Find out more about this ambitious project now on our weekly blog, A Parallel World. Thanks for staying in touch through our newsletters – as always, we welcome your feedback. If you’d like more real-time interaction, you should definitely check out our Facebook page, which is as active as ever… and you might be interested to know that we now post on Instagram as well.